Cody Ponce of Cal Poly Pomona has officially signed with the Milwaukee Brewers organization. 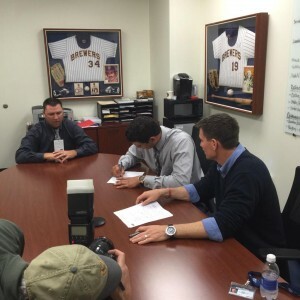 Ponce was taken in the second round of the 2015 MLB Draft out of Cal Poly Pomona. He will begin his professional career as a member of the Helena Brewers, which is a rookie affiliate of the Brewers. This entry was posted in Cal Poly Pomona athletics, Cal Poly Pomona baseball, Cody Ponce and tagged Brewers, Cal Poly Pomona, Cody Ponce by James H. Williams. Bookmark the permalink.